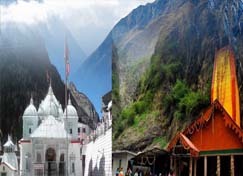 India has best Chardham Pilgrimage tour which is count top spiritual yatra as well Chardham Yatra tour provide best Chardham Yatra Tour Package, Chardham Tour Packages 2019, Chardham Yatra Package 2019 At Affordable Chardham Yatra Cost, Chardham Yatra Package Cost. 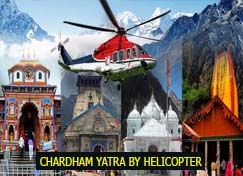 At Char dham yatra, we also provide customized Chardham Yatra Package 2019 from various cities like New Delhi, Delhi, Vijayawada, Hyderabad,Chennai,Bangalore, Gurgaon, Noida, Faridabad, Ghaziabad, Meerut, Haridwar, Rishikesh, Dehradun, Chandigarh, Amritsar, Ludhiana, Kotta ,Jodhpur Ahmedabad, Vadodara, Surat, Pune, Mumbai, Kolkata, Jaipur, Lucknow, Rajkot, Baroda, Nasik, Udaipur, Patna, Agra, Jamshedpur, Ranchi etc. 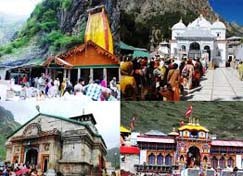 Here is the detail of Char Dham Tour & Travel Packages for 2019. You can select the best suitable package for yourself and contact us for advance bookings. 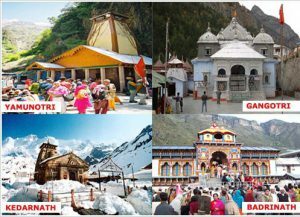 Char Dham Yatra, the name itself defines the epitome of four spiritual places that are known for Chhota Char Dham demolishing all the sins attained by the devotees in their lifetime and grant them the salvation to attain peace and humility in their life. 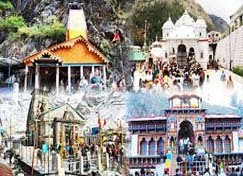 Char Dham Tours is one of the most popular pilgrimage routes that recall millions of devotees every year from all around the world that comes here in search of great peace of mind and to attain nirvana from their bad deeds done in their lifetime. 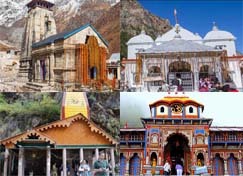 The Char Dham Yatra is linked with the four holy shrines of Hindus named with Kedarnath, Badrinath, Gangotri and Yamnotri. The journey of Chardham Yatra is associated with the spiritual importance of The Chardham attaining Moksha from all the sins you have committed in your lifetime. In Hindu Mythology, it is believed that Chardham Tour Package is the route that washes away all your sins and brings enlightenment in your life showered with the blessings of the Lords. Every year, millions of devotees make visit to this auspicious holy place and pay homage to the temples seeking contentment towards abolition of all their sins committed in the past life. It is presumed that the holy Chardham yatra package brings in a sense of belongingness, self-actualization and heart-purity in life of a devotee. The Chardham Yatra situated in the Land of God, popularly known as Uttarakhand receives great exposure of pilgrims during the pilgrimage season. 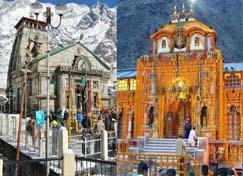 Each of the four shrines of the Yatra carries some or the other mythological reason due to which it got placed in the holy trip of Chardham Yatra. Kedarnath is considered as the Shrine of Lord Shiva. It is one of the 12th Jyotirlingas and an important part of Panch Kedar. Badrinath is known to be the temple of Lord Vishnu and also famous with the name Badri Vishal. It is believed that Great Hindu Philosopher and reformer Saint Adi Shankaracharya attained freedom from the incarnation from here only. Badrinath Dham: Badrinath Temple is one of the most important Shrine and holiest pilgrimages for Hindus in India. This temple is known for being a Lord Vishnu Temple also termed as Badri Vishal in Hindu mythology also is a best part of Panch Badri. This temple is located in the Chamoli district of Uttarakhand in the silent valley of Garhwal Himalayas where Alaknanda River flows. 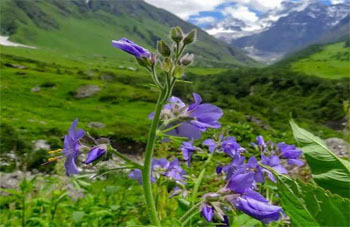 Badrinath town is quite famous for stunning beauty of snow clad mountains, Holy River and the religious impact of the temple in the surroundings. It is believed that Badrinath Yatra is famous since the time of Satya Yuga, when Lord Vishnu meditated here for thousands of years and Goddess Lakshmi provides him the shadow in the form of a Badri tree. 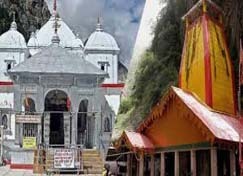 Kedarnath Dham: Kedarnath Yatra stated the Kedarnath Temple which is located in the bank of Mandakani River. 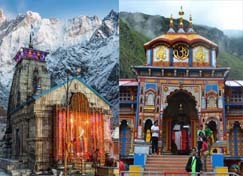 The Kedarnath temple is one of the sacred pilgrimage and a part of the Char Dhams. Also, it is a renowned part of Panch Kedar in Uttarkhand and known as one of the 12 Jyotirlingas of Lord Shiva in India. The location of Kedarnath temple is surrounded by breathtaking snow-capped peaks that attract lots of tourists and devotees every year. This renowned temple of Kedarnath is dedicated to incarnations of Lord Shiva. People believed that it is this place, wherein Lord Shiva absolved Pandavas from the sin of killing their own cousins in the war of Kurukshetra. The temple carries its own mythological reason, being the sacred place where Ganga first came on earth by the due request made by King Bhagirath for his penance in front of Lord Shiva. Yamunotri Dham: Yamunotri is the only source of Yamuna River. Yamunotri Yatra is the last Shrine of the Chardham Yatra in Uttrakhand, India. After Ganges, Yamuna is the second largest and holiest river in India. Yamunotri is located in the Garwhal Himalayas in Uttarkhand. As per Hindu Mythology, Yamuna is the daughter of Sun God, Surya and Sister of God of Death, Yamuna. Chardham Yatra --It was like a dream come true. Mr. Gaurav of Global Hospitality did a great job, making it possible for us. We were a family group of 12 and our trip started from Delhi on 14th May 2017 and return on 25th May. An initial meet and greet at Delhi and briefing on the tour would have done wonders. Please keep this in your plan for the future travelers. With divine blessing of Kedarnath ji & Badrinath ji we completed the Chardham yatra and would like to thank and appreciate your team for the excellent arrangements and coordination. The vehicle provided to us for the Yatra was kept neat and clean by the driver Mr Devendra Shaini who also very courteous and helpful.Thanks to his driving skills and knowledge of the routes we had hassle free trip and would like to compliment him. The hotels at all the places was very neat and tidy with good food.Especially we liked the accommodation at Barkot ( CRV ), ShivParivar ( Uttarkashi ) ,Shivalik Valley ( Sitapur ) and Himalayan Abode ( Joshimath ) The food at all the hotels was good and we enjoyed fresh and hot food. As already informed to you only at Badrinath the Hotel and food was below our expectation. 2) At some places the room was + / - 2 floors from ground level and being elders had some problem. Where ever possible the hotel accommodated at ground or +/ - 1 level. May be at the time of booking age of travellers can be intimated to Hotels with specific request to provide rooms at ground or first floor level. We once again would like to place on record our thank and appreciation to your entire team for making our Yatra pleasant and enjoyable. Hi Team, First, thanks for all the support in the trip. Overall the trip went very well. On feedback, I had quite a few. But when i discussed with my family, it just came to two: The first was hotel Giriraj - The rooms were too small. There were plenty of better options in that area. The second was the vehicle itself. The vehicle could have been much better. It was very basic and even lacked a regular music system. The saving was the driver, who knew the terrain and the locale. Missed one important one - the best one was your reach ability and guidance. This is the most important. Keep it up. Hope you have a great season ahead. Will catch up with you later. Our Chardhaam trip can be summarized in simple words - - Sun god's grace - Rain gods mercy - Immaculate planning our C-in-C - Enthusiastic pilgrims (some of them defying age) - Energetic and ever accommodative Ratha Sarathy (Driver) (Most important) - - Ever supportive, heeding into last minute requests and innovative approach to excellent service by Gaurav and his team made our 17 day Chardhaam trip a memorable and event free one. All of us had an excellent darshan every where and once again thank Gaurav (Global Connect Hospitality) and his team. It was indeed a very memorable experience which we had thoroughly enjoyed during our tour of 11 days. The arrangements made by your company at various places were very good with very prompt and good services. Before embarking on the tour, we had some apprehensions in our minds regarding the services and the hotels but all I can say now is that we had a very wonderful time and all the hotels were very decent. Personally I thank you very much for all the good arrangements and services provided by you. This is probably the best that we could have got. I regret not getting a chance to meet you, would want to thank you in person.